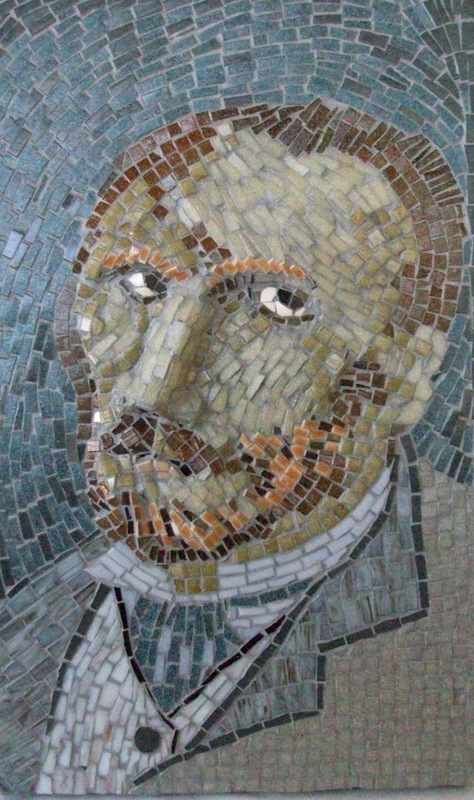 You might recognize "Vincent" as the header to my blog, above. He has been patiently waiting on a wall at the Baobab Tree Gallery in Bradenton's Village of the Arts for three years, but he finally has a home. He has been purchased by a couple who travel the country in an RV, so "Vincent" will see the world for a few years before settling down. I will miss seeing his intense gaze when I visit the gallery, but I am confident that he will be much appreciated. Thank you so much, Bob and Nancy! Now I am inspired to make something in a similar vein - perhaps another artist portrait? Monet would be fun, with the full white beard he grew in his later years. Or maybe I'll try my hand at a Cubist-style Picasso, or maybe even Leonardo. Fortunately, the possibilities are endless! The button quail is done. I'm glad I didn't try anything fancier for the background; I like the way the bird seems to emerge from the similar colors. I also like the combination of three main colors in the background; I've seen other artists use this technique and I think it adds depth. Now I have to figure out how to frame it. For smaller pieces, I've been using boards that are just the right thickness for a 3/4-inch tile border. This one is slightly thinner, and I don't have tiles that size, so I'm considering a shadow box-type frame in dark brown. 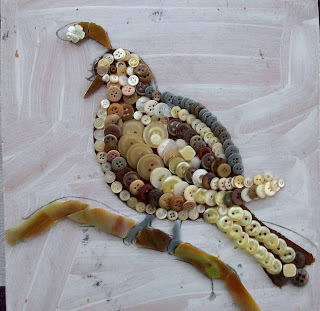 Ever since I learned about a species of quail actually called "button quail" (probably because it's so small), I knew I had a use for the many buttons that my sister Barbara has been sending me. She loves garage sales, and she has a standing order from me for junk jewelry, buttons, and other strange stuff that I like to use in my work. I spent a lot of time thinking about this project before starting on it. For one thing, I wasn't sure whether I wanted to glue the buttons flat or stack them; as you can tell, I did a bit of both. I think the stacked or staggered ones give a feeling of movement to the wing portion, and the flat ones define the breast nicely. Also, I still haven't decided whether to grout or not, so I painted the bird outline first in brown paint, so the primed board wouldn't show if I decided not to grout. 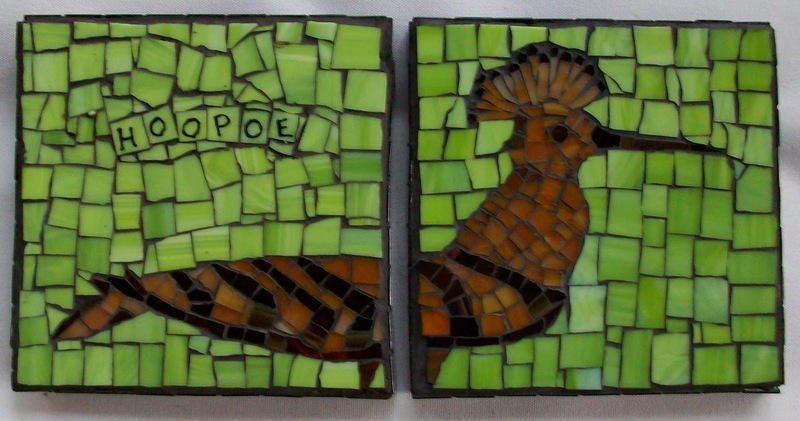 The beak, topknot, feet, and branch are stained glass. 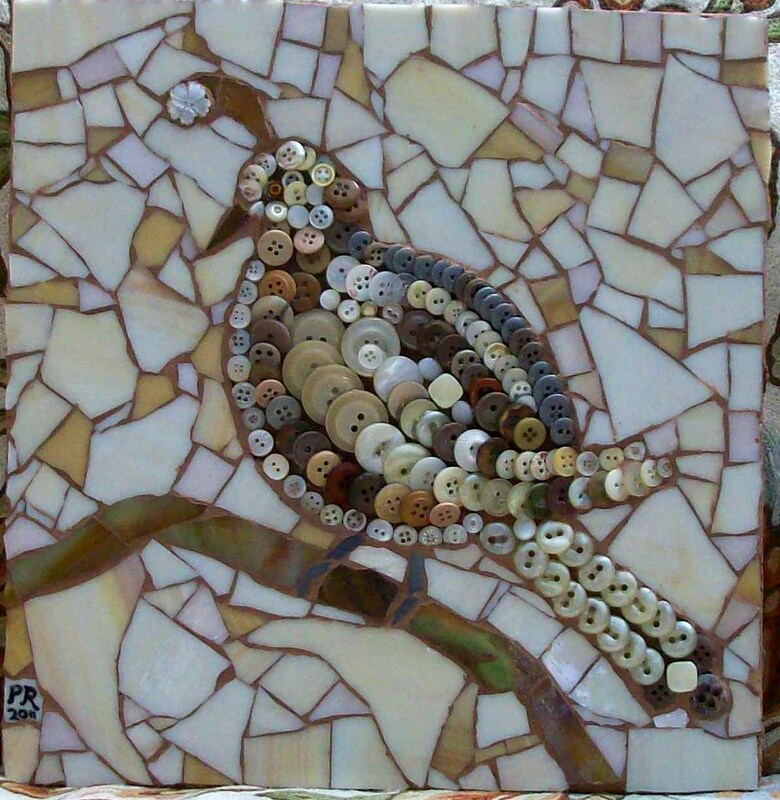 I'm still thinking about the background - leaning toward an abstract stained glass design that will not fight for attention with the buttons, and I will most likely grout any stained glass parts. The other option is a painted background; that would be a real departure from previous work, but who knows? It might work best. 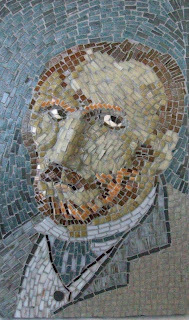 I can always paint first, and mosaic over it if I don't like it. The color combination is pretty close to what these birds actually look like, though my interpretation of it is loose, to say the least. I might replace the small millefiori I used for the eye with a larger half-bead so it's more prominent. Stay tuned for phase 2! I was driving downtown a few weeks ago and saw this wonderful wall in front of a house near Sarasota's arts district, Towles Court. I love the haphazard nature of it, the riot of colors and materials, and the combination of cinder blocks and bottles. It got me thinking; remember the gecko that I had to redo? 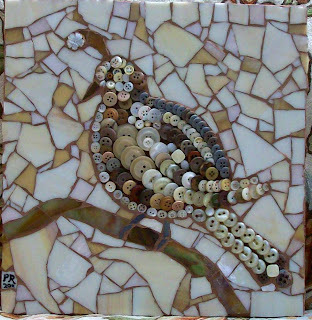 Well, I saved all the tiles I removed from it the first time, and they are piled in a big bucket just waiting for a project like this. Now to just find the time . 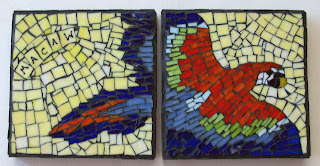 . .
"Macaw" is a new diptych. I love the feeling of flight in this piece. It took a while to finish because I was missing the orange-red for the tail portion; when I started the bird, several months ago, I must have had only a small piece which I used for the upper body, because when I went to finish it I could not find that color anywhere - even my local stained glass store didn't have it. I am indebted to Belinda Chase from my monthly mosaic group for giving me a small sliver of orange-red so I could finish that tail! I still have not found small alphabet letters that I am happy with, so when it was time to finish Macaw, I finally just decided to use glass paint. It worked so well that I redid the Hoopoe in the same way - I was never really happy with the plastic letters I used previously. If you bake the tiles after painting them, the paint adheres and even stands up to grout.